Art under the Oaks has been running for nearly twenty years. Started in 1982 in the Grounds of San Pedro Church in Islamorada, this has always been one of the most popular of the January Florida Keys Events. The event kicks off at 9:00am in the morning, unless you are actually wanting to get involved and become a vendor, and then your day at the show will start much earlier. You'll have to make sure your stall is the best and most enticing after all. But instead of visiting the event like everyone else who just turn up on the day, if you are an artist or someone with a creative bent, make sure you contact the organizers on the information at the bottom of this page, as they will be able to allocate you a position to show your wares. It's not uncommon for the event to earn as much as $10,000 in one day. And that is what makes this craft show just one of the Florida Keys Special Event, and a tradition that deserves its place as one of the favorite things to do in January each year. 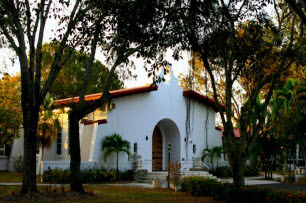 The whole community get involved, gathering in mass under the beautiful canopy of the oak trees to experience homemade crafts, paintings and works of fine art made by local artists to the area. 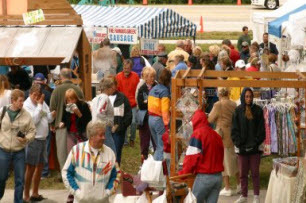 Live music floats out, as people wander between the stalls laden with specialty food, and arts and crafts made for and by children throughout the keys. Children will love the face painting, puppet shows and other bits laid on specially to keep them entertained whilst you get a little free time. You can even undertake a self guided tour of the garden, whilst you wait to see if your raffle ticket has been drawn out and you've won one of the prizes that have been donated for the event. It really has a lovely warm, community feeling and generally because there is such a large turnout. The Florida Keys do these kind of things really well. If you are thinking of coming down to the event, beware that the parking is not plentiful and can be somewhat of a problem. You can park at the church for a $5 donation, but I truly wouldn't bother. As in pure Florida Keys, lets make things as easy as possible style a shuttle service is laid on from the local school (Coral Shores High School) which is about quarter of a mile up the road. Park for a fee and a bit of hassle, take the shuttle, or as I always do, have a lovely stroll in the sunshine to the event, and then get on the shuttle back laden with whatever I have bought that day.